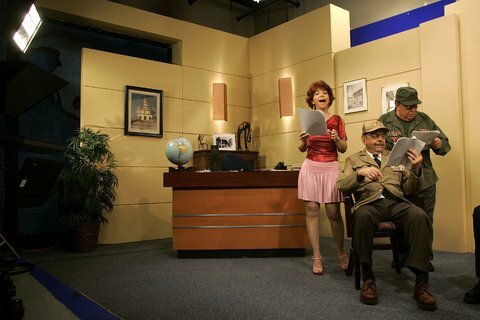 The Office of Cuba Broadcasting announced today that it is looking for broadcast and television journalists, producers, narrators, editors, Internet data analysts, social media strategists, radio commentators, studio technicians and others to work at Radio & TV Martí in Miami. The application deadline is 5 p.m. Oct. 9. Those hired would work as independent contractors from Nov. 1, 2015, through Oct. 31, 2016. A sampling of the job requirements are below. • Performs a combination of services that will include researching, interviewing, writing and voicing original news stories and reports. • Ability to adapt broadcast material for Radio, Television and Internet about events in Cuba, the U.S. and other countries. • Produces and edits creative audio reports (CRs) on Adobe Audition digital technology. • Demonstrates ability to record and process interviews by phone, live face to face, or on the field. 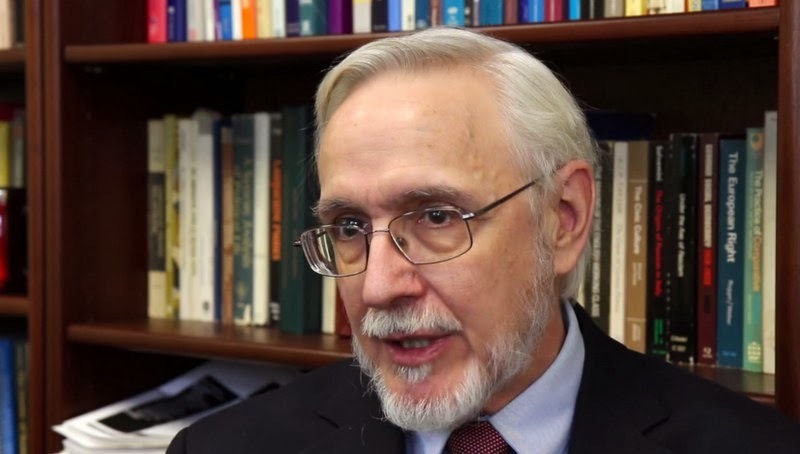 • Should have extensive knowledge of Cuba, its people, culture, institutions and political situation. 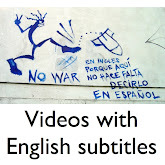 • Ability to adapt English material to Spanish. • Must command different information means to validate the comprehensiveness, accuracy and balance of news products. 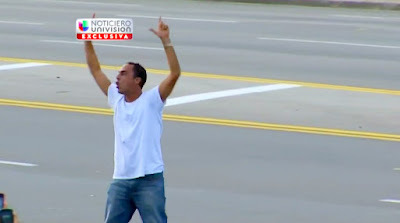 Dissidents to Pope Francis: "Freedom!" 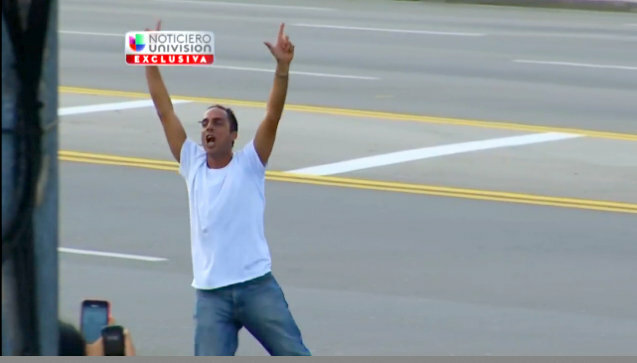 Univision captured video of a Cuban dissident appealing to Pope Francis. As security forces led the man away, he tossed pamphlets into the air. Capitol Hill Cubans identified the man as Zaqueo Baez of the Cuban Patriotic Union, or UNPACU. Baez, along with another man and a woman, raised their arms and yelled "Freedom!" Capitol Hill Cubans said Baez asked the pope to support freedom for the Cuban people. The video shows the pope reaching out and putting his hand on the man's head. 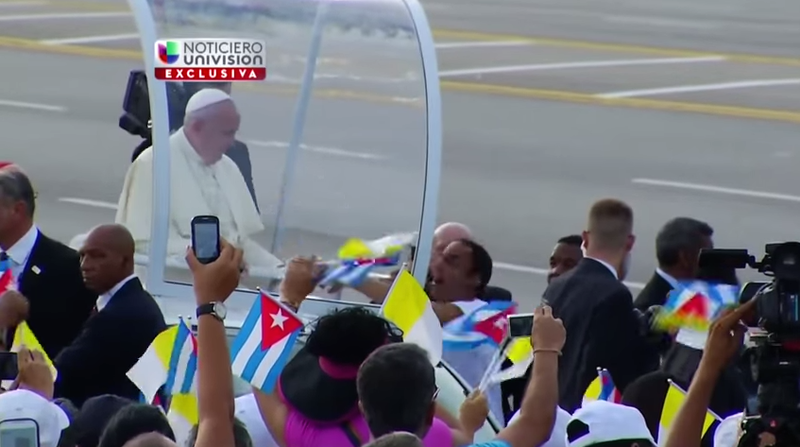 Seconds later, a security agent yanked the dissident away from the pope's vehicle. Security agents detained the three dissidents and led them away from the Mass as other men picked the pamphlets from the ground. Following instructions from the extreme right in Miami, three counterrevolutionaries carried out another act of provocation while the Pope greeted the Cuban people minutes before Mass began at the Plaza of the Revolution in Havana. 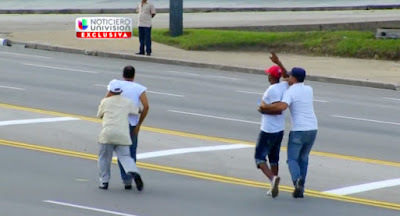 The provocateurs implicated in the unfortunate incident are the counterrevolutionary Zaqueo Baez Guerrero, who has a lengthy record as a protester, the unknown Ismael Bonet Reñé and María Josefa Acón Zaldiña, wife of Zaqueo and a subordinate of Berta Soler (leader of the opposition group Ladies in White). 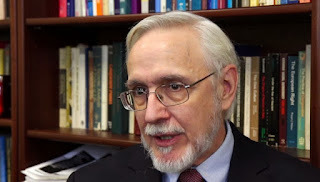 William M. LeoGrande, coauthor of Back Channel to Cuba: The Hidden History of Negotiations between Washington and Havana, wrote a piece on Saturday criticizing Radio & TV Martí's pursuit of a comedy team that would lampoon Cuban officials and others on the island. 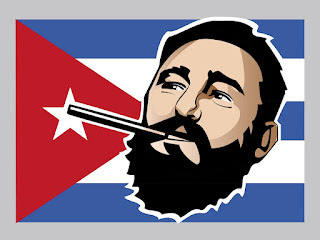 (See "U.S. tax dollars for parodies of Cuban politicians"). So while U.S. diplomats are negotiating with their Cuban counterparts on issues like environmental protection and counter-narcotics cooperation, trying to build confidence in order to tackle sensitive subjects like property claims and the repatriation of fugitives, the Office of Cuban Broadcasting is preparing to insult the Cuban officials with whom we are trying to reach agreement. This is so obviously counter-productive that you have to wonder if it isn't an intentional attempt to sabotage the president's policy by bureaucrats whose programs--and jobs-- depend on perpetual hostility between the United States and Cuba. On Thursday, the Center for Democracy in the Americas, a Washington, D.C., group that supports normalized relations with Cuba, complained about the comedy team proposal in a letter to Secretary John Kerry. The Executive Branch of the U.S. government must speak with one voice about our Cuba policy. Otherwise, we risk confusing the overwhelming majority of Cubans, who want normalization to take place, and emboldening hardliners in Cuba who do not. From the White House: "President Obama today spoke by phone with President Raul Castro of Cuba to discuss the process of normalization between the two countries in advance of Pope Francis’s upcoming visits to Cuba and the United States. The President underscored the importance of the United States and Cuba re-establishing diplomatic ties and the reopening of embassies in our respective countries. The two Presidents commended the role that Pope Francis has played in advancing relations between our countries. 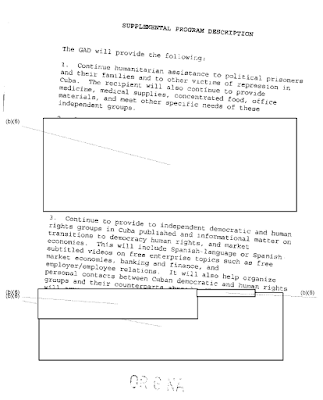 They noted the cooperation between U.S. and Cuban medical professionals during the U.S. Naval Ship COMFORT’s visit to Haiti this week. In addition, the leaders discussed steps that the United States and Cuba can take, together and individually, to advance bilateral cooperation, even as we will continue to have differences on important issues and will address those differences candidly." 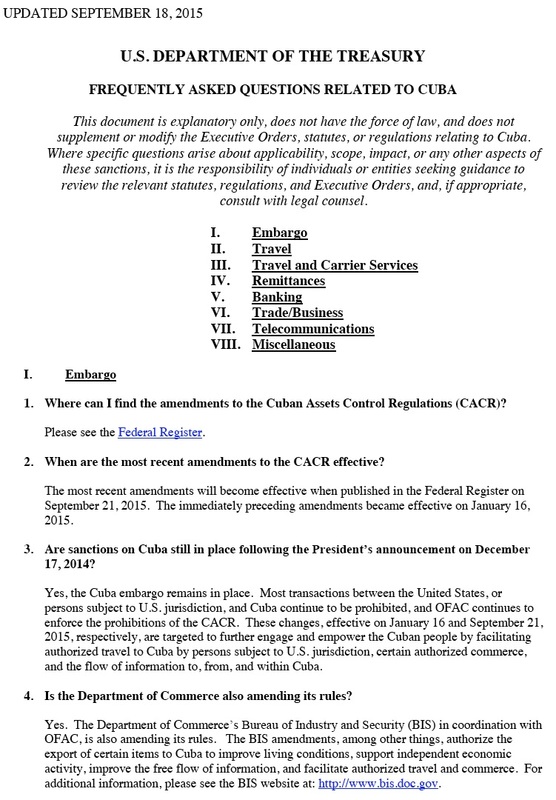 WASHINGTON – Today, the Department of the Treasury and the Department of Commerce are announcing additional revisions to the Cuban Assets Control Regulations (CACR) and Export Administration Regulations (EAR), building off the changes put into place by Treasury and Commerce on January 16, 2015 and further delivering on the new direction toward U.S. relations with Cuba that President Obama laid out last December. The changes, consistent with the President’s December announcement, will take effect on Monday, September 21, 2015, when the regulations are published in the Federal Register. 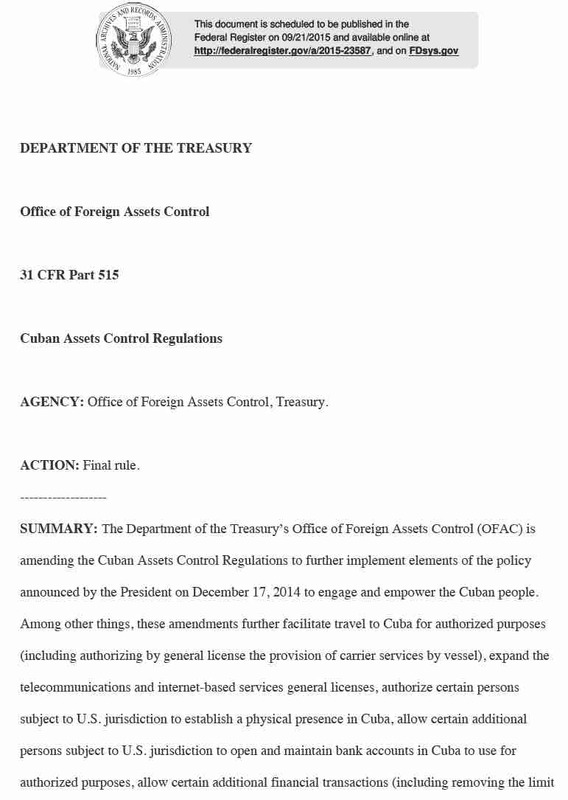 A fact sheet detailing the revisions, which will be administered by Treasury’s Office of Foreign Assets Control (OFAC) and Commerce’s Bureau of Industry and Security (BIS), is below. Social cleansing before pope's arrival? 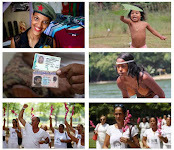 The Cuban Commission for Human Rights and National Reconciliation expresses its deep indignation and concern about the operation of "social cleansing" that the government of Cuba has developed in recent days in three major cities, and, according to our estimates, has had as a result the internment of thousands of beggars, panhandlers, people in rags, the mentally ill and other wandering homeless, mostly elder people without a home. This "social cleansing" aims to put hide these people from the view of pilgrims, foreign journalists and other visitors who will be in Cuba these days because of the presence in our country of His Holiness Pope Francis. announced by the President on December 17, 2014 to engage and empower the Cuban people. Attention all comic geniuses, you still have time to submit your plan for 10 comedy sketches aimed at lampooning the Castro brothers and other Cuban VIPs. (See "U.S. tax dollars for parodies of Cuban politicians"). The Broadcasting Board of Governors, which runs Radio & TV Martí, extended the deadline for proposals to 3 p.m. Sept. 18. While some anti-Castro activists like the idea of spending tax dollars to make fun of Cuban officials, some supporters of rapprochement with Cuba object. The American government is looking for a comedy troupe to produce a “uniquely funny” variety show lampooning Cuban politicians and other public figures. Why on earth would the Obama administration want to spend taxpayer dollars ridiculing Cuban politicians as the two countries are starting to normalize relations? It turns out that even as a new era of engagement dawns, Congress continues to fund efforts that were centerpieces of a decades-long policy of sabotage and confrontation. Here’s an idea: Kill it. The American government shouldn’t be in the business of commissioning political parody. Our policy toward Cuba has been a joke long enough. Under the memorable title "OCBSatire," the Office of Cuba Broadcasting announced that it has "a requirement for exclusive, non-transferrable rights for a Cuban satirical variety and comedy sketch show for inclusion in its programming..."
A group of Florida musicians plan a Sept. 27 concert to raise money for a project called Musicians Across the Straits, touted as "a way to celebrate the normalization of diplomatic relations with Cuba through music." 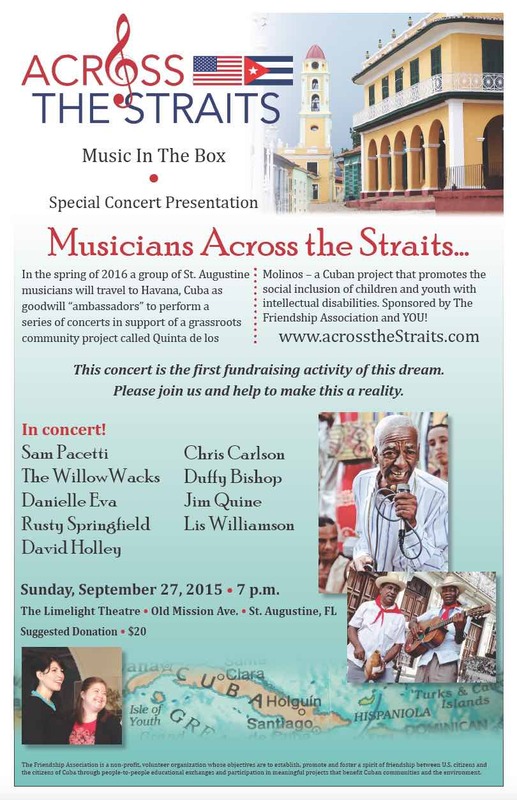 The non-profit Friendship Association in St. Augustine, Fla., is organizing the effort. The group's goal is to promote "a spirit of friendship through people-to-people educational exchanges and participation in meaningful projects," according to Yosi "Jo" McIntire, the association's outreach coordinator. Ten St. Augustine musicians will perform concerts that our host, Sociedad Civil, will use to raise awareness and to promote the merits of the social inclusion of intellectually challenged youth into society. 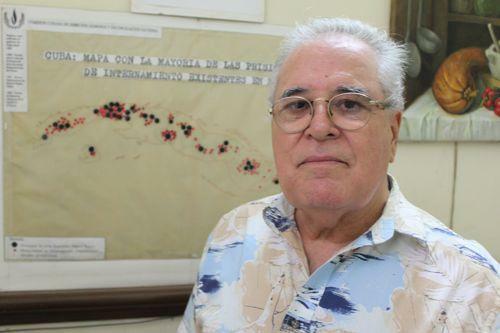 Sociedad Civil is a branch of the Office of the Historian of the City of Havana, Eusebio Leal, responsible for stimulating grassroots community projects in Cuba. For this initiative, the Friendship Association has partnered with the Down Syndrome Association of Central Florida and is reaching out to other U.S. organizations working in the area of youth with intellectual challenges. 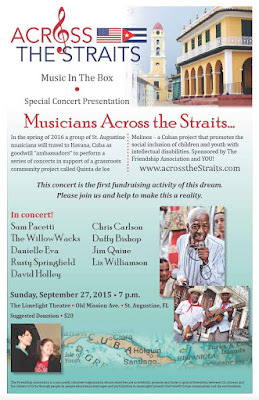 The concert will be held at the Limelight Theatre at 11 Old Mission Ave in St Augustine. Doors open at 6 p.m. Suggested contribution: $20. 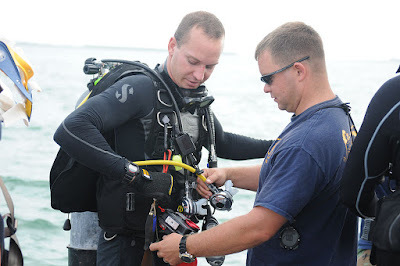 Guantanamo Bay Naval Base announced today that it wants to buy a remotely operated vehicle capable of plunging 1,000 feet into the sea and recording high-resolution video, among many other tasks. Naval Station Guantanamo Bay, Cuba Dive Locker requires a Remotely Operated Vehicle (ROV) System to support the commands mission in multiple areas such as salvage survey/recovery, pier inspection, identification of unexploded ordinance; mitigating the risk of putting a diver’s life in jeopardy, survey of ships, searching/recovery of deep water when it is not obtainable with a diver, hazardous environment intervention, victim search, rescue and recovery, oceanographic/scientific survey/research, and port/maritime security operations. Cuba appears nowhere on Washington Software's website, but the Caribbean nation has evidently been vital to the company's financial happiness in recent years. 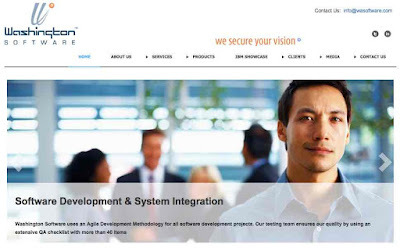 The U.S. government has paid Washington Software $6,691,899.32 since July 2011. 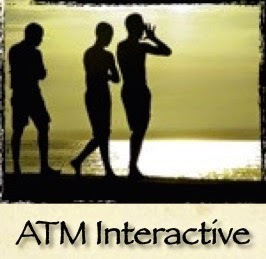 The Maryland company designed Piramideo, a social network made for mobile phone users in Cuba. 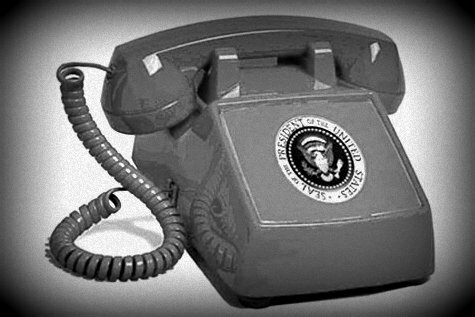 Piramideo is sponsored by the U.S. Bureau of Transmissions to offer Cubans a social media without thematic restrictions. What in the heck is the Bureau of Transmissions? At best, it's an awful translation of the Broadcasting Board of Governors, or BBG. At worst, it's meant to deceive users of Piramideo. I wonder why American taxpayers must continue to finance this operation? Aren't there any existing, free social networks that could do the job? 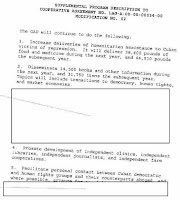 On Oct. 8, 2011, I filed a Freedom of Information Act request for contracts between the U.S. Agency for International Development and Grupo de Apoyo a la Democracia, based in Coral Gables. USAID responded earlier this month, sending me contracts and a September 2000 letter from the agency to the group's director, Frank Hernandez-Trujillo. The documents show that USAID gave Grupo de Apoyo more than $10 million from September 2000 through August 2010. By December 2007, the organization had reported spending half that amount on shipping and delivery costs, a whopping $5,294,047. 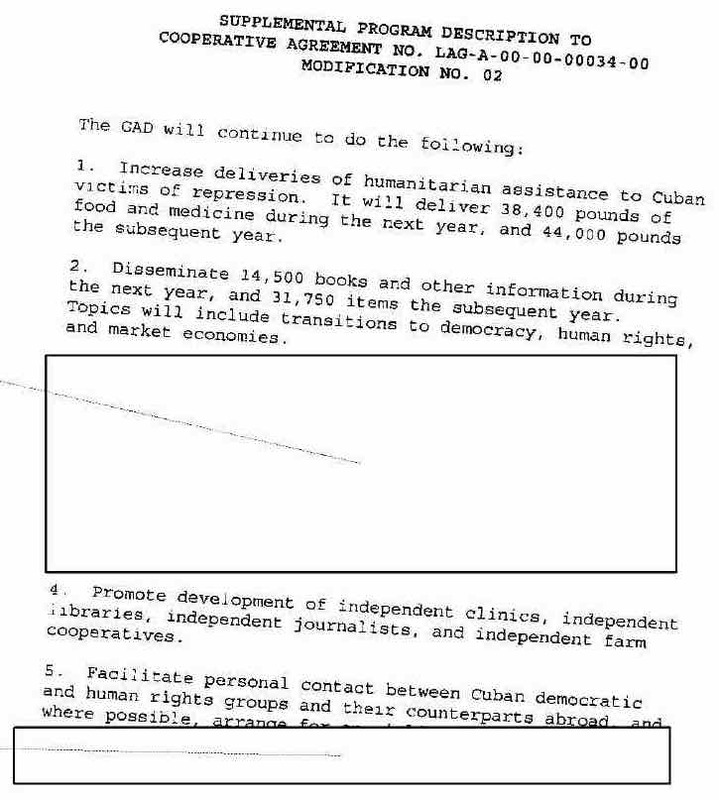 $2,504,807 for food, medical supplies, clothes, printed materials and other items that it sent to political prisoners and their families in Cuba. USAID's contributions to Grupo de Apoyo included $250,000 in emergency relief funds: $50,000 for Hurricane Charley and $100,000 each for Hurricanes Dennis and Wilma. In the beginning, Grupo de Apoyo - then called Grupo de Apoyo a la Disidencia - focused mostly on humanitarian aid for political prisoners, including the distribution of food and books. 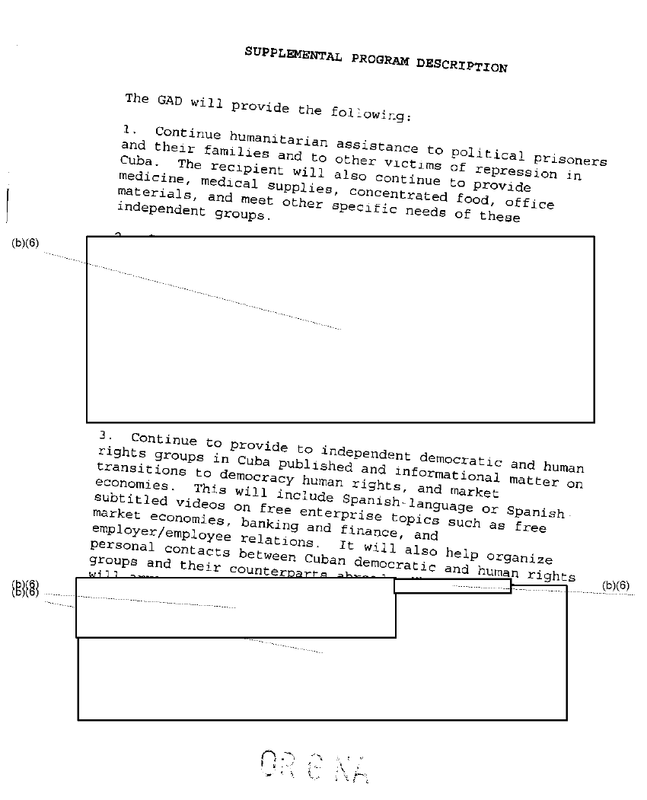 But it soon expanded into other areas, including hurricane relief, the promotion of "independent clinics, independent libraries, independent journalists, and independent farm cooperatives" and meetings between "Cuban democratic and human rights groups and their counterparts abroad." And the Miami group's initial $400,000 contract with USAID mushroomed into an agreement worth millions of dollars. The National Endowment for Democracy is looking to hire a Cuba program officer who would be required to carry out field visits to monitor the work of grantees. Fluency in Spanish, a master's degree and at least five years of democracy-related work are required. The Program Officer reports to the Senior Director for LAC program and work with LAC and Grants staff to provide programmatic and administrative support to NED’s Cuba grants program; contribute to developing the Endowment’s strategy for Cuba; sets programmatic priorities, monitors and evaluates projects, and tracks program budgets. The U.S. Agency for International Development announced today that it is seeking managers to run its Cuba programs. 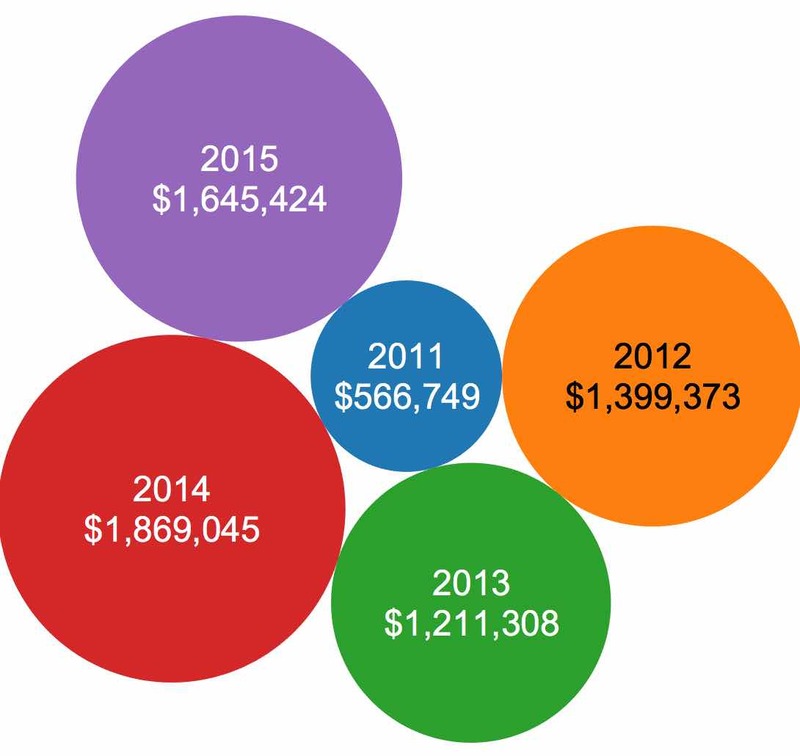 Salaries will range from $90,823 to $139,523 per year. The job announcements - here and here - do not say how many people will be hired, but describe a need for "multiple" managers. Experience in the areas of democracy promotion, human rights, civil society development, community development, and youth programs, is preferred. Expert knowledge and experience in the development of civil society, social capital, and the promotion of community development, as well as human rights, especially in closed societies, is highly desired. Monitoring and evaluation expertise and experience in environments that are difficult to assess is also desired. Successful candidates must obtain a "secret" security clearance within nine months of accepting the position. Information deemed "secret" is defined as that which would "cause serious damage to national security" if disclosed. A committee aimed at "building a firewall around" American fugitive Charlie Hill will hold its first organizational meeting on Sept. 10 in Brooklyn, N.Y. The Committee to Defend Charlie Hill "will serve as a counter-friction to the politicians who are playing with Mr. Hill’s life to placate their law and order constituency," said Hill's lawyer, Jason Flores-Williams. We will reveal the hypocrisy of those who would whitewash the past and ignore the present. 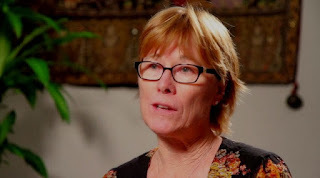 We will work to prevent extradition, but should Mr. Hill be extradited, we will defend his constitutional right to fair trial and the presumption of innocence. The meeting is scheduled for 6:30 p.m. to 7 p.m. at Pete’s Candy Store, 709 Lorimer St. in Brooklyn. Defending his community against police brutality and government repression (COINTELPRO), Mr. Hill left the Bay Area in 1971 to establish a Southern headquarters to raise funds for schools in Africa. 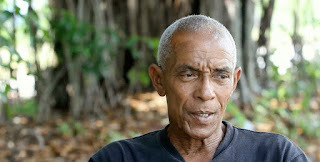 Driving through New Mexico, Mr. Hill was wrongly accused of killing a police officer and forced to flee to Havana, where he has lived in peace for more than 40 years. The U.S. government wants to hire entertainers who would produce "uniquely funny, ironic, satirical and entertaining" comedy shows targeting Cuban officials, politicians and others on the island. These skits must be able to parody public figures, politicians, government officials, entertainers, as well as recognizable members of Cuban civil society groups who are active in the political and civil sphere and widely known throughout the Island. Proposals are due at 3 p.m. Sept. 14. The format will be a 30 minute, scripted satire preferably by a team with a demonstrated ability to engage and entertain audiences in Cuba, and a popular following inside the Island. Each skit should ideally be comprised of 3 segments with accompanying commercial breaks followed by a formal close. Total running time between 26-30 minutes. In early 2014, it appeared likely that the U.S. Agency for International Development would leave Cuba by the end of this month. But at least one USAID Cuba program has survived and will continue into 2016. The International Republic Institute, one of three current USAID partners in Cuba, will be active on the island through September 2016, according to USAID. Two other USAID partners - the New America Foundation and Grupo de Apoyo a la Democracia - are scheduled to end their Cuba projects this month. 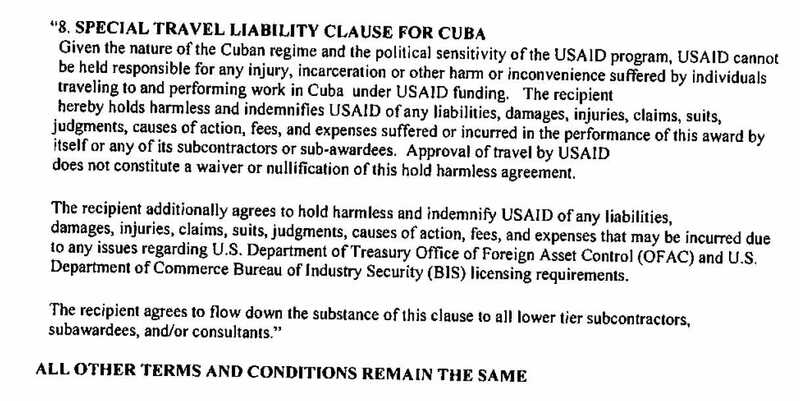 In February 2014, USAID had been expected to end its Cuba projects this month. But then lawmakers this year decided that they wanted USAID to continue working in Cuba as part of stepped-up efforts to promote democracy on the island. Lawmakers also increased spending on Cuba programs to $30 million in fiscal 2016, up from $20 million, according to the latest State and Foreign Operations Appropriations bill. In June, the House Appropriations Committee said USAID, the National Endowment for Democracy and the State Department would share the $30 million. 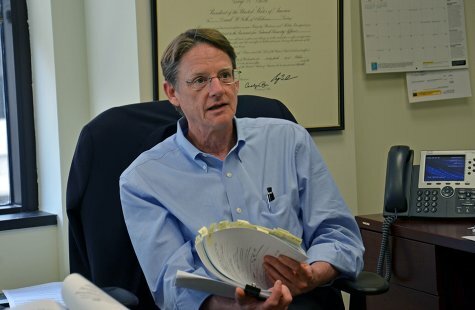 Dan Fisk is chief operations officer for the IRI. 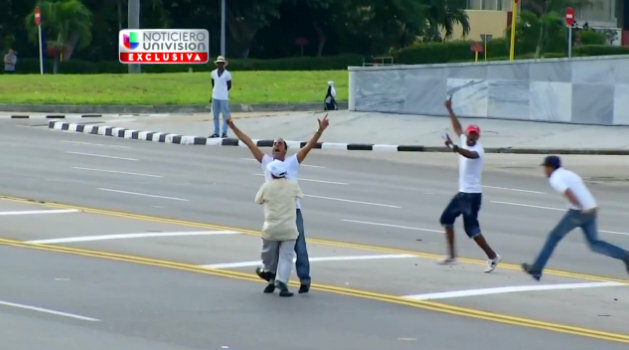 The group has carried out eight opinion polls Cuba. USAID's website does not show how much money IRI will receive for its Cuba work in fiscal 2016. It doesn't describe the program, either. My hunch is that it's for some sort of digital democracy program and perhaps some more polling.